Not even the U.S. Department of Agriculture yet knows the full extent of this summer’s drought on fall retail food prices. The department’s monthly crop report says to expect some price increases due to shortages of soybeans and corn. But it could be 2013 before the drought’s impact is fully felt at the grocery store. In fact, the annual American Farm Bureau Marketbasket Survey shows that prices had actually dropped about 3 percent in the second quarter. 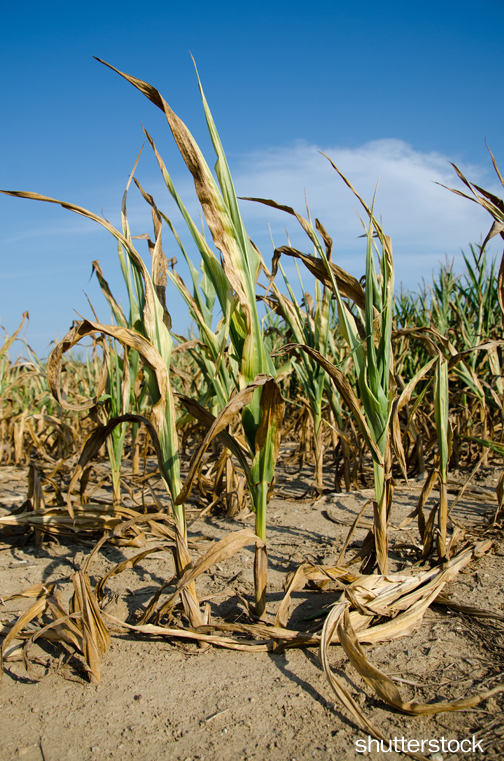 “That’s probably not going to have a lot to do with what you pay for corn flakes this fall,” says John Anderson, American Farm Bureau economist, of the drought’s long-term fallout. “Somewhere down the road that will influence retail prices though.” Costs will especially increase for poultry, beef, dairy and pork because of higher feed prices. Stephanie and her husband, Daniel, run Allenbrooke Farms in Spring Hill, and they just finished their first full 24-week season of offering fresh produce to their CSA “farm-ily,” grown on their 120-acre farm using only organic methods. Despite the hard summer, they are determined not to raise the rates for members this year to further encourage more people to support local farmers. The USDA notes that farmers currently earn less than 16 cents per dollar spent on food, down from 31 cents in 1980. The drought wasn’t easy on the Allens. The two creeks and acre-sized pond on their property dried up this summer, putting a strain on their drip irrigation systems. Plus, weed seeds spread easily during the dry spell, then sprouted throughout their farm after the heavy rains, causing the Allens even more work heading into autumn. “The 2012 growing season will not go down in the history books as one of the better ones we have experienced,” says Tammy Algood, food marketing specialist with the Tennessee Department of Agriculture. “The mild winter included a record warm March. As a result, most fruit crops bloomed several weeks earlier than normal. Noble Springs Dairy in Franklin doesn’t dabble in vegetables, but Dustin Noble and wife, Justyne, are feeling the harsh summer sting nonetheless. Of their 130 or so goats, 70 are currently milking so as to produce the farm’s natural goat cheese products. Goats depend on certain weather conditions to produce at peak levels. Considering that the origin of most of his goats is the Swiss Alps, a long, hot summer was not good for the animals, especially when the grass they eat was drying up. The Nobles seriously considered raising their prices but were concerned about the future of the business. No one is a bigger proponent of using local ingredients than chef Jeremy Barlow. His landmark Hillsboro-Belmont restaurant Tayst – the first and only green certified restaurant in Nashville – is closing at the end of the year so he can spend more time with his family and focus more on promoting his message of buying only local food. His 12South sandwich shop, Sloco, practices a “declaration of food independence,’’ using bike delivery to lessen emissions and serving only seasonal, sustainable food from local farms. He also gives five percent of the restaurant’s profits to Community Food Advocates, which pairs community gardeners with local food services. Barlow is consistently working with about 30 farmers at any given time from a roster of about 70 a year. His diversity in lineup helps ensure he can almost always get any seasonal ingredient, no matter what weather surprises may occur. It’s not failsafe, of course, but that is the point. Even if restaurants take a stand and change their business model to more easily adapt to a seasonal menu, that isn’t going to stop a customer from craving a BLT in the middle of winter – and going somewhere else to find it. If nothing else, the end nutritional value of a vegetable consumed within a few days of being picked is going to exceed something that is shipped from Holland, organically-grown or not. “We really need to make sure that we support all of the new restaurants that are going through the effort to support local food,” Barlow says. No matter how bad things have been the past few summers, farmers are doing all they can to counteract potential problems ahead of this winter and again next summer. They have to act if they want to rebound. The lack of a crop this summer did not mean growers could cut back drastically on care of their orchards, vineyards and small fruit plantings since, “fruit buds for a crop are formed the summer of the year previous to the appearance of the crop,” Allgood says. Noble has tried to stockpile as much hay as possible for his goats, but he already knows whatever he can get will not be enough. “A really hard winter can be tough on them, too, but not nearly as bad as a really hot dry summer,” he says. “What I have tried to do, because I know with the kind of weather we had this summer, there is going to be a huge demand for hay, so I have just tried to buy up as much hay as I possibly can to be able to get through the winter. By December or January, the price of hay is going to go up even more because the supply is so short this year.